The embattled head of the Veterans Affairs Department on Tuesday shook off any indication that he might step down from his post in the wake of a scandal regarding his travel last year, saying he was setting the direction for the agency and everyone should either get on board or find another place to work. Reforms and changes at VA are moving forward and that progress will continue, Secretary David Shulkin said after addressing the American Legion’s Commander’s Call conference. Other people throughout the department are reconsidering their roles and their future there, he said, but Shulkin himself has no plans to resign his post. Shulkin came under fire recently when an inspector general’s report found the secretary had improperly accepted gifts and used government funds while traveling in Europe last year on official business. The secretary said he was not going to spend his time “looking for subversion or doing investigations” but he would address “people who are pursuing different agendas” as they come to his attention. The differing visions among those in the Trump administration about the future of VA revolve largely around the role the private sector will play in providing health care for veterans. 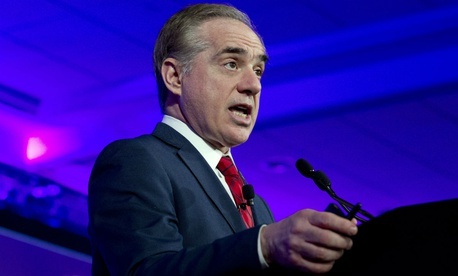 Shulkin has joined members of both parties in Congress in calling for a “strong VA system” that should be supplemented by access to private care when VA services are underperforming or unavailable. Some outside observers and even some individuals at VA and advising President Trump have called for much more dramatic changes that would move VA health care into a non-profit and allow veterans full discretion to seek private care whenever they choose to do so. Members of Congress and veteran service organizations have been largely tempered in their response to the IG report, saying the oversight should continue but standing by Shulkin as the right person to lead the department. The White House has said it has no reason to suspect Trump has lost faith in the secretary. The secretary said he was not concerned that his newfound my-way-or-the-highway approach would create a chilling effect among the department’s career employees, explaining that the department depended on a “unified approach” to helping veterans. Shulkin was initially critical of the inspector general for its report, but on Tuesday acknowledged that the watchdog’s work is critical. He noted that he has complied with the IG’s recommendations—Shulkin has reimbursed the government for the cost of his wife’s travel and for the tickets to the Wimbledon tennis tournament he received as a gift—but said his political adversaries were using the information to undermine him.